When we return to Alaska from Greece, we carry home enough food to last until we next visit the island. We stuff our bags to the very edge of the airlines’ weight limit. Each year, one of the items in our luggage is dried black-eyed peas grown by my husband’s cousin Zafiris on an island in the North Aegean Sea. One of my favorite ways to eat black-eyed peas is paired with wild greens, if they are available, and supermarket greens when they are not. I prefer the peas in a zesty broth to fight back the winter cold, and season them with a combination of bulb fennel and fennel seed. A hearty veg dish indeed. The Greeks are starting to use more fennel in their dishes and that's a good thing! This looks delicious. It has been quite some time since I made black eyed peas and then it was in a curry dish. I love black eyed peas with "seskoula" silver beat. Is this recipe Greek? I just wanted to say to Peter that Marathoryza (or finocchio as they call it nowadays) was well known to Greeks since ancient years and was highly appreciated for its pharmaceutical properties. Peter, at least on the island, fennel is a very commonly used herb and is grown in most kitchen gardens. It is the form of fennel grown for its leaves, and has a more distinct fennel flavor than fennel bulb. That's why I added the seeds! Thanks, Gretchen! 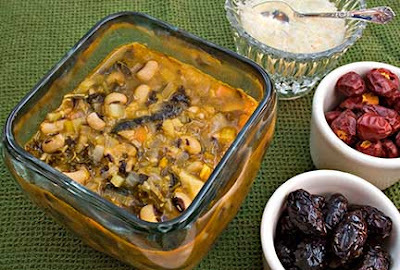 I've never heard of black-eyed peas with curry, but it sounds intriguing. Ivy, me too, I love seskoula in pretty much anything, it is one of my favorite kinds of horta. 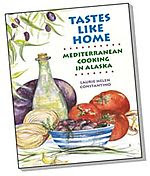 The original recipe is Greek, but I had to adapt it to the ingredients we have here in Alaska (like the fennel I was mentioning to Peter), plus it has some non-traditional elements like the Aleppo pepper. Also, in winter I like this as a soup, while what I've had in Greece is cooked in only a little water so it is more like a plate of beans than it is a soup. Thanks so much Maninas! The greens picture is one of my favorites.